أصدر مجلس الكنائس العالمي والمجلس الوطني لكنائس المسيح في الولايات المتحدة الأمريكية بيانا يدعو إلى وضع حد لانتهاكات حقوق الإنسان وإنهاء المعاناة المستمرة للأجيال في الأراضي المقدسة وذلك خلال المشاورة المشتركة بشأن الاوضاع في الأراضي المقدسة. WASHINGTON, DC: At 12:30 pm ET Wednesday, September 14, 2016, General Secretaries Jim Winkler (National Council of Churches, USA) and Rev. Dr Olav Fykse Tveit (World Council of Churches) will issue a statement summarizing the work of this week's groundbreaking consultation between Christian leaders, humanitarian organizations, and human rights organizations on disturbing new developments in the Holy Land. The Middle East Council of Churches (MECC) held its 11th General Assembly this week, bringing leaders from regional churches together to pursue a unified ecclesiastical voice in the midst of human suffering that is permeating the region. בתום שמונה שנות שרות, מנואל קינטרו פורש מתפקידו כרכז היוזמה הבינלאומית המכונה "תכנית הליווי האקומני לפלסטין וישראל" (EAPPI - Ecumenical Accompaniment Programme in Palestine and Israel) של "מועצת הכנסיות העולמית" (World Council of Churches – WCC). “I have an absolute confidence in your youthful and great enthusiasm and your heightened state of awareness that you will be ambassadors of peace, mercy and cooperation among all peoples.” This message, from Grand Imam of Al-Azhar Dr Ahmad Al-Tayyeb, visibly uplifted and inspired young people attending a seminar, “Youth Engagement, Religion and Violence,” in Cairo this week. 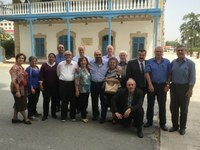 Manuel Quintero is retiring after eight years of service as the international programme coordinator for the WCC Ecumenical Accompaniment Programme in Palestine and Israel (EAPPI). He took time to reflect on the mission of EAPPI, particularly within its current context, as well as aspects of the programme that have been dear to his heart. הכומר ד"ר אוו בוארסמה יטול את תפקיד רכז תוכנית EAPPI הבינלאומית בג'נבה החל מה-26 בספטמבר 2016. בתום שמונה שנות שירות כרכז תוכנית EAPPI הבינלאומית שמושבה בג'נבה, הגיע מר מנואל קינטרו לגיל פרישה ויעזוב את סניף EAPPI הבינלאומי של 'מועצת הכנסיות העולמית' (World Council of Churches) בסוף אוגוסט. سوف يتولى القس الدكتور أويه بويرسما في جنيف مهام منصبه الجديد اعتبارا من 26 سبتمبر / ايلول 2016 كمنسق البرنامج الدولي المسكوني للمرافقة في فلسطين واسرائيل . وذلك بعد وصول السيد مانويل كوينتيرو المنسق الحالي في جنيف للبرنامج الي سن التقاعد، بعد ثماني سنوات من الخدمة مغادرا منصبه في برنامج المرافقة المسكوني التابع لمجلس الكنائس العالمي في نهاية أغسطس/ آب. Rev. Dr Owe Boersma will take over the post of EAPPI international programme coordinator in Geneva, effective 26 September 2016. 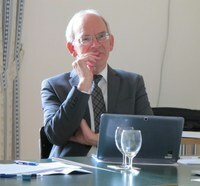 Mr Manuel Quintero, after eight years of service as EAPPI international programme coordinator based in Geneva, has reached retirement age and will be leaving the World Council of Churches’ EAPPI international office at the end of August. What does the impending 500th anniversary mean outside its European birthplace? In the Middle East, Reformation stands for a strong legacy yet also the uncertain future of a tiny and splintered minority. The churches of the Reformation remain important within the constellation of Christian groups, say non-evangelical Christians, who call upon them to lead in ecumenical outreach to newer charismatic and Pentecostal groups. في كل صباح يصل هذا الرجل المبتهج واللبق إلي مكتبه في القدس الشرقية حاملا نبراس أمل. فقد كرس الدكتور برنارد سابيلا حياته كلها دفاعا عن حقوق الشعب الفلسطيني. و يواجه سابيلا كل يوم تحديات جديدة مع مشاكل تتعلق بالعلاقة بين الفلسطينيين والإسرائيليين وذلك من خلال عمله كمدير تنفيذي لدائرة خدمة اللاجئين الفلسطينيين. وفي الوقت ذاته، يريد أن يحيا سابيلا فقط كمواطن عادي في البلد التي تمتد فيها جذوره وجذور عائلته دون التدخل باستمرار في النزاع الفلسطيني الإسرائيلي. ويأمل أن لا يؤثر دائما هذا النزاع على هويته الفلسطينية. Every morning a cheerful and articulate man arrives at his office in East Jerusalem with at least a grain of hope. Dr Bernard Sabella has devoted his entire life to the rights of the Palestinian people. 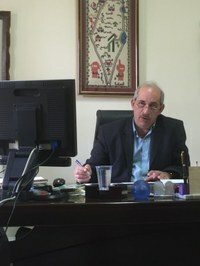 In his job as the executive director of Department of Services to Palestinian Refugees, he encounters issues concerning the Palestinian-Israeli relationship daily. For Ramzi Zananiri, executive director of Jerusalem and the West bank at the Department of Service to Palestinian Refugees, which is part of the Middle East Council of Churches, the current situation in the Holy Land is "heart-breaking", and he says the Palestinians are "hostages" under troublesome realities. In the wake of the highly-anticipated Chilcot report, the World Council of Churches (WCC) stands by its original position, first adopted in 2002 via a wide consultative process with its member churches, that all possible efforts should have been exhausted to prevent the war in Iraq. Hope in a Pilgrimage of Justice and Peace formed the integral thread for proceedings at the meeting of the Central Committee of the WCC in Trondheim, Norway this week. The 2016 meeting took place 22-28 June, the second gathering since the Central Committee was elected at the WCC 10th Assembly in Busan, Republic of Korea in 2013. In a “Statement on the Forced Displacement Crisis,” a call for the world’s nations to “honour the letter and spirit of their obligations under international law, including human rights and refugee law and especially the right of asylum” was issued on 28 June by the WCC Central Committee.